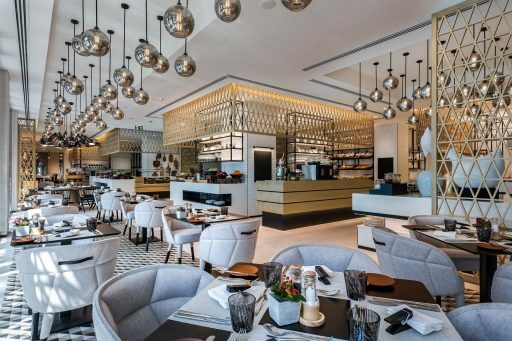 Carine Restaurant at the Emirates Golf Club takes its inspiration from a French brasserie. Designed by LW Design, the interiors are light and feminine, and depict the refined, rugged charm of Northern France. The Ena restaurant is a perfect setting to enjoy Greek, home-style cuisine, with stunning views of the Atlantis Hotel. Designers LXA collaborated with the restaurant’s founder, Lena Maniatis, to create an interior that is modern, contemporary and elegant. Indya by Vineet, a Michelin starred restaurant designed by LW Design with contracting work by Bond Interiors, offers a casual and fun dining experience with a strong focus on vibrant colours. 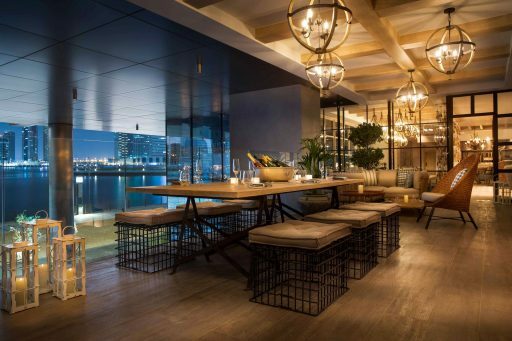 Located in Dubai’s latest, attractive destination, Bluewaters Island, Mitts & Trays restaurant sports subtle and clean interiors, punctuated with unique details that make them distinctive. Designed by Gatserelia Design, the restaurant is located in a main locale of Beirut, which is a hub for prêt-à-porter boutiques and renowned eateries, making it the perfect place for Quartier Chic. The interiors of the restaurant exude a playful ambience with a feminine touch. Two at Symphony is the F&B extension of luxury fashion boutique, Symphony, created by two Emirati sisters, transitioning spatially from a boutique store to a casual yet contemporary cafe. H2R Design was tasked to create the interiors of Hardee’s restaurant in The Dubai Mall’s new Fashion Avenue extension. The goal was to create an elevated, modern and versatile setting that would attract a wide demographic of diners. Designed by Hecker Guthrie, this Italian restaurant located at the new Fashion Avenue at Dubai Mall, flows effortlessly from a welcoming interior into a stunning alfresco terrace with unparalleled views of the Dubai Fountain. Inspired by seasons and earthly elements, Creneau International designed and built the Tero restaurant in Brussels. The four seasons are entwined around a central column that houses a wine cellar, and as guests walk past the structure of slats, the imagery on them changes to reflect the various seasons. Designed by Creneau International in collaboration with Bond Interiors, 24TH St. is an Asian eatery inspired by traditional Korean, Chinese, Japanese and Indian street food culture. Located on the mezzanine floor of Al Bandar Rotana Hotel, this all day dining restaurant draws inspiration from a Scandinavian marketplace. LW Design was briefed to create a simple and casual venue with emphasis on the food counters and live cooking stations, which they executed beautifully with Decovision undertaking the fitout. Designed by WA International, Bleu Blanc is a French farmhouse inspired restaurant in the Renaissance Downtown Hotel in Business Bay. Khansaheb Interiors did the fitout and Emirates Innovation Engineering Consultants were in charge of the project management. The Nando’s brand has become synonymous with colour, creativity and fun, in their food and their decor. For this project, Compass Project Management was briefed to create a vibrant, lively and welcoming space so diners should feel comfortable while enjoying their meal. Designed by Omar Nakkash, this Parisian Bistro and Cafe located at One Central, World Trade Centre, offers a chic and contemporary setting with a sociable approach to French dining. Summertown Interiors did the latest design and build of the canteen at the Daimler MENA regional office. The brief given was to transform an existing training facility into a 350 square metre cafeteria space that would seat 150.